I am a huge fan of farmers markets. One of the reasons why I love summer time. I love the energy of the market, and I feel good supporting local farmers and vendors. Plus, the options are amazing! 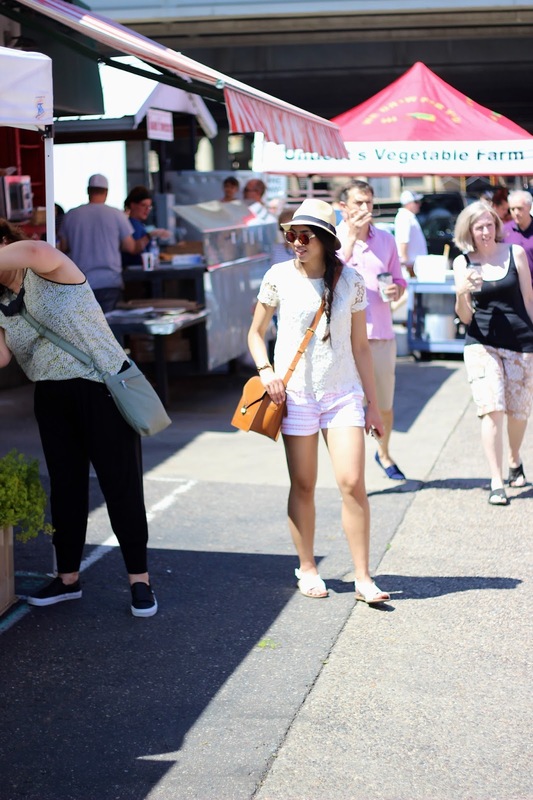 When I heard that Minneapolis has incredible farmers markets, without a doubt it was on my agenda of must-haves when we were there a few weeks ago. I was in heaven! So many options and vendors! I was in awe with the variety! I was tempted to make some purchases but realized that the perishable items won’t last long since we stayed in a hotel without refrigeration, and I wasn’t sure if I could take them on the plane. Instead, Tre and I decided to enjoy some homemade lemonade. Oh my gosh they were phenomenal and spot on for that hot day! It wasn’t too sweet but it wasn’t tart either. Just perfect! Do you guys enjoy going to farmers markets? What’s your favorite part of the market? I love farmers markets too and totally agree, it's great to support the local farmers! I also love this look — the sunglasses look so fabulous with the shorts and that's such a great bag! What cute photos!! I need to visit a Farmers Market this summer!! Your shorts are so cute!! 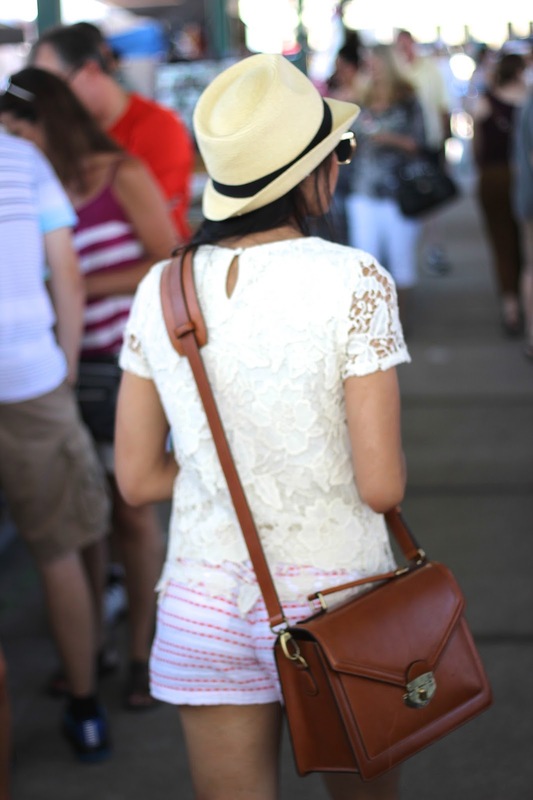 Such a cute outfit and love that hat on you! Great seeing you last night! Your outfit is just adorable!! I love the subtle bit of red in the shorts to break up the all white but still give a seamless and flawless look! So cute!! I love farmers markets! Such great deals and local charm. (: It's a huge reason we eat so many fresh fruits and veggies in the summer months. You look adorable! Great bag! Totally the perfect excuse! Thanks Kiki! I love going to a farmers market! I just have to get myself up and out of the house in time on Saturday before our local one closes. 🙂 This is the perfect outfit. You look so good! Haha it is hard because they do end early! Thanks Amy Ann! Hello, I am happy to meet you!!! Thanks Paola for stopping by! I LOVE the farmers market, I go every weekend!! – I am mostly obsessed with that bag though! They're seriously the greatest! Guess what, that bag is a camera bag! Great shots Rach! Love those sunglasses! What a fun little day adventure! Going to Farmer's Markets are one of my favorite summer things to do! And these shots are so perfect! I LOVE going to the farmers market!! We go every Saturday!! Yum! 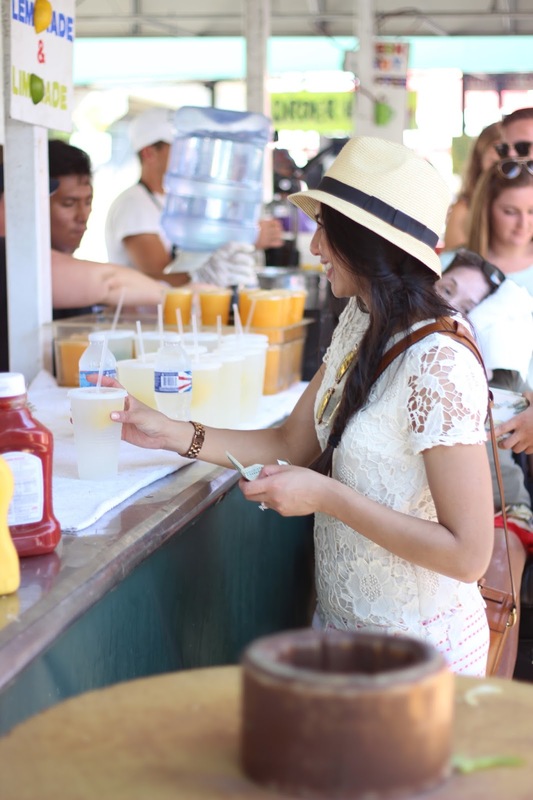 I love a good lemonade that's for sure!! You look great! Love it!! It is so much fun! Thanks Danielle! 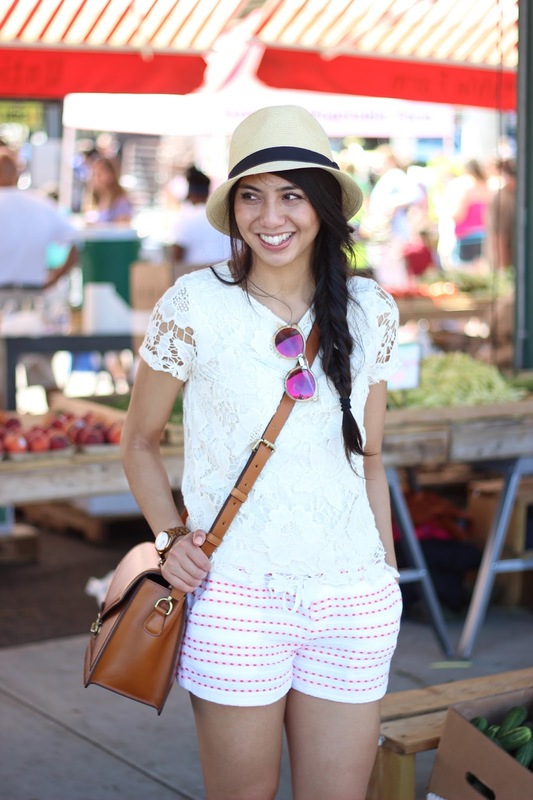 I love farmers markets…it's always fun to discover local things there! Love the outfit! Thanks Valerie! There are so much fun things to find! Aww, those pics are so adobs and it was great seeing you last night!! Thanks Vanessa! It was great seeing you too! Aren't they great?! Thanks Mikela! What an awesome post! You look lovely. 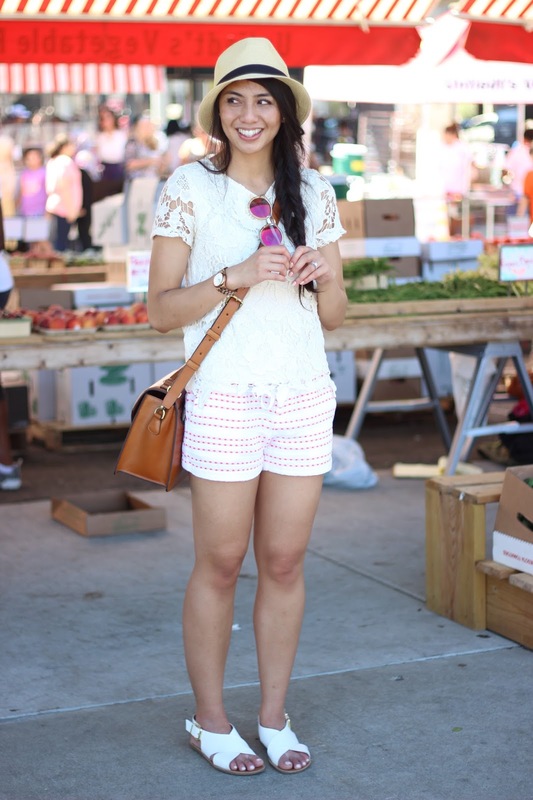 I love the pink shades that are accented by the pink embroidery on your shorts. Minneapolis farmer's market looks fun! I am OK with farmer's markets, given I am not big on cooking I don't get much out of the food section.. but the arts/creative section – GIVE MORE MORE! They do have an awesome arts and craft section! Thanks Kelly! I love farmer's markets! I agree-the energy is great there. 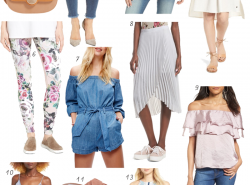 Your cute outfit is perfect for the occasion! Best summertime pastime ever! Thanks Ivete! 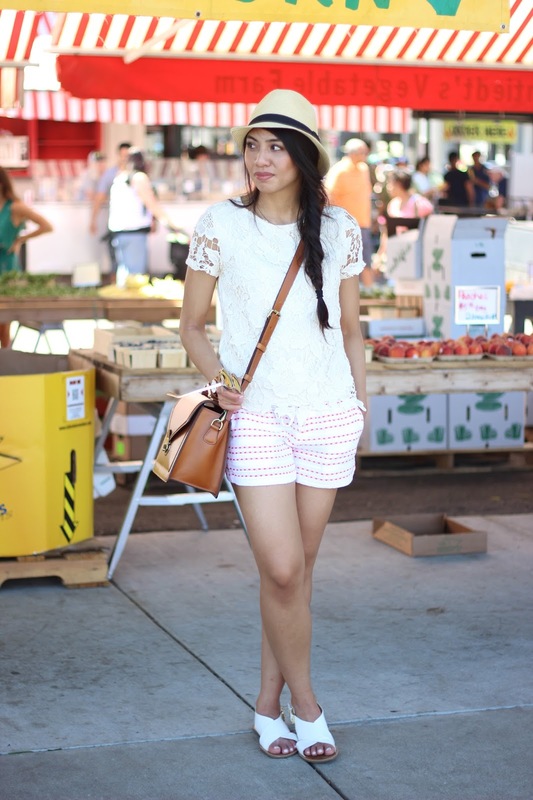 love the lace with the pink detail in the shorts. great look! 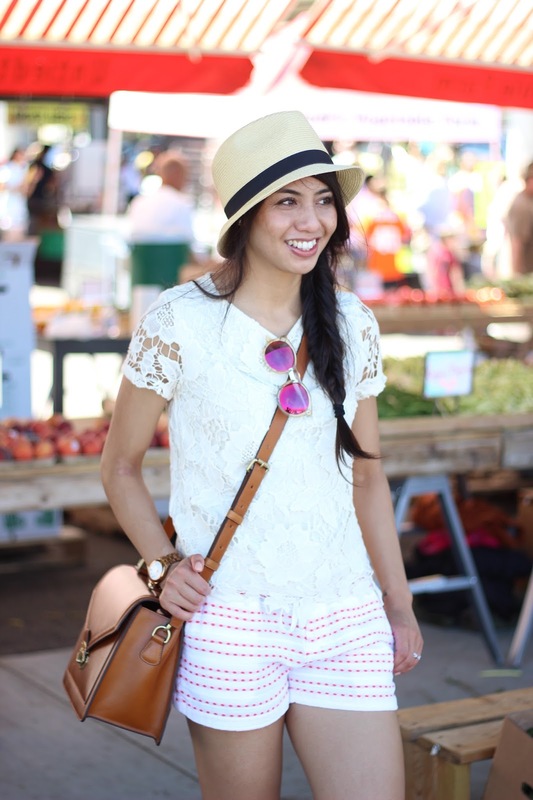 Super cute look for the farmer's market! Love it! Can't get over how pretty you look, Rach! This is such a cute and feminine outfit. This is such a cute outfit! Perfect for the Farmers Market! Loving that lace top! Such a pretty outfit! So adorable, love your look!!! Thanks Lucy! Thanks for stopping by! Wonderful combination! 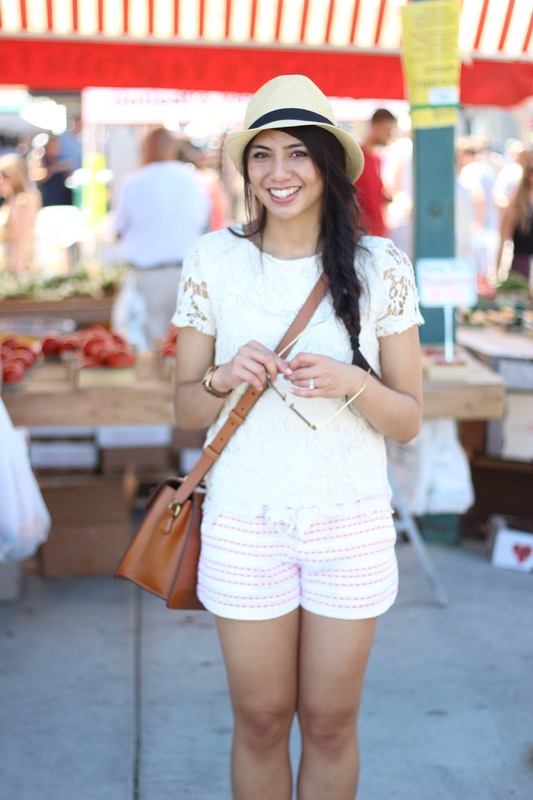 These shorts are super cute and the hairstyle definitely is on point!